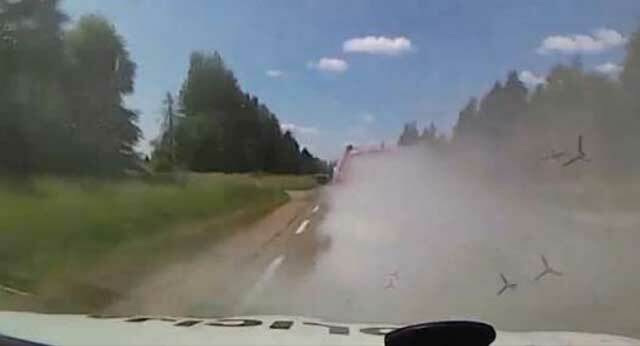 A motorist in Lithuania channelled his inner James Bond by deploying spikes and a smokescreen in an effort to throw off police officers in hot pursuit. 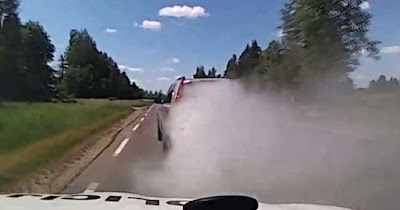 Dashcam footage of the action-packed chase, which occurred on Thursday in the outskirts of the city of Marijampolė, shows the police hot on the heels of a Volvo. As the police car got close, the Volvo driver let off a smokescreen, quickly followed by spikes, which for a few seconds causes the police car to stop at the side of the road. But the officers quickly resumed the chase, and were soon able to bring the Volvo driver to a stop by blocking its path and forcing it into a guard rail. It is not known how the Volvo driver was able to equip the car with such gadgets, or what crime he was alleged to have committed before the chase.